If we say India is diverse and different from many other countries in the world, would it be an exaggeration?? We don’t think so. You name the parameters which determine the uniqueness of any particular country and every time India steals the show – whether it's climate, food, festival, fashion, music, architecture, or languages. We also know when you travel to a country like India (no, we will not get snubbed), there are many aspersions on your mind as well, but you still make it to our country and invest quite an amount of your time, energy, and of course your hard earned money. Naturally, you would want everything to be perfect (don’t be apologetic about it) and that was the only inspiration and idea behind writing this Blog. Through this post we wish to empower you with all the knowledge and information about what to carry and what not to while preparing for your travel to India. We also attempt to predict weather patterns through different months of the year in different parts of the country. 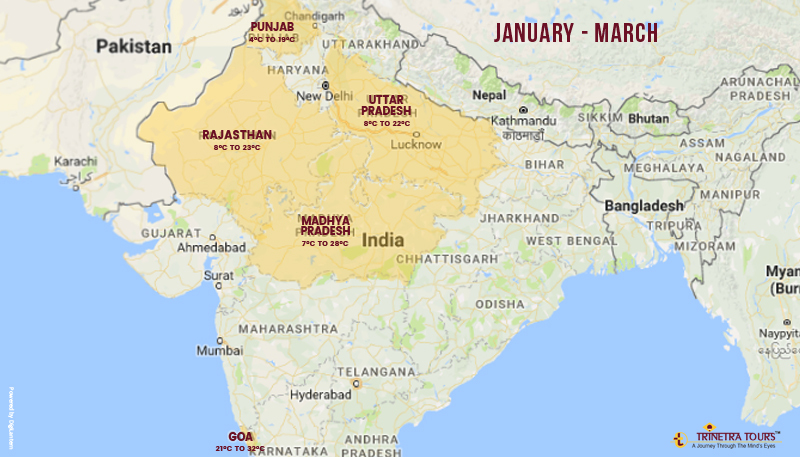 What to expect: The temperature in Goa remains between 21°C to 32°C, in Uttar Pradesh the temperature remains between 8°C to 22°C, Punjab - 4°C to 19°C, Rajasthan - 8°C to 23°C, Madhya Pradesh - 7°C to 28°C. What to carry: Among all the places listed above, Goa and Rajasthan are warmer destinations compared to Punjab, Uttar Pradesh & Madhya Pradesh. When you’re travelling either to Goa or Rajasthan you must carry a bottle of sunscreen, beach wear ( Of course for Goa), moisturizer, sunglasses, comfortable pair of shoes, a hat and some slightly warm clothing like woollen jackets or pullovers. For other destinations, you must ensure having an insect repellent in addition to other things including a comfortable pair of shoes. However, you’ll get to enjoy sunny days here even in winter but you should still carry woollen socks and heavy woollen clothing pieces to keep yourself warm during chilly mornings and cold nights. 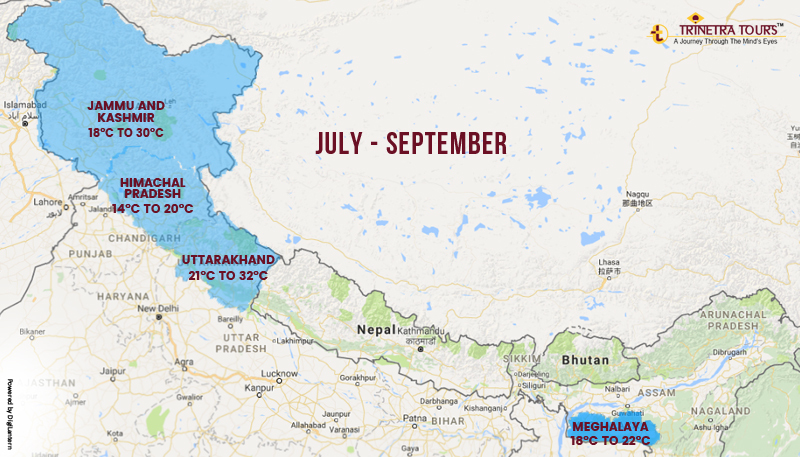 What to expect: Karnataka - 21°C to 33 °C, Andaman & Nicobar Island - 23°C to 31°C. What to carry: Karnataka is the haven for nature lovers. You should carry comfortable walking shoes as it would be helpful for visiting the ancient ruins of Hampi, Rock-cut temples of Badami, as well as for nature and trekking destinations like Coorg or ooty. Andaman & Nicobar Island proffer you with the breathtaking beaches and therefore your list of things to carry should include flip-flops, hat, sunscreen, insect repellent, towel, beachwear, and a camera to capture the moments like sunrise and sunset at the beach – a truly surreal view. What to carry: These are the most visited hill stations of India, and, when the rest of the country deals with scorching sun during these months, these places are pleasant and not as warm. Though, it is not winter but you should carry warm clothing as the weather can change erratically from sunny to overcast and foggy due to the monsoon rains. This of course holds to the charm and romance of the destination. We suggest carrying a windproof/rainproof jacket, gloves & socks, and please do not forget a comfy pair of sports shoes because you’ll have to do a lot of walking. 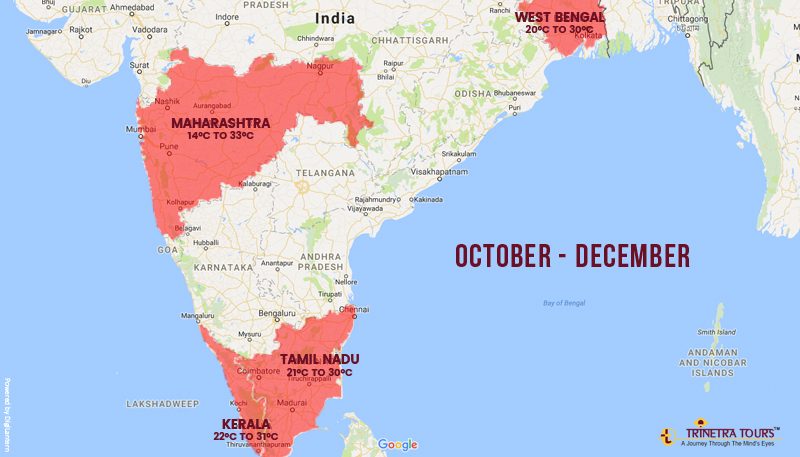 What to expect: Tamil Nadu - 21°C to 30°C, Kerala - 22°C to 31°C, Maharashtra - 14°C to 33°C, West Bengal - 20°C to 30°C. What to Carry: These are the places which attract most of the travelers in winter as the hill stations in India are too cold during these months. 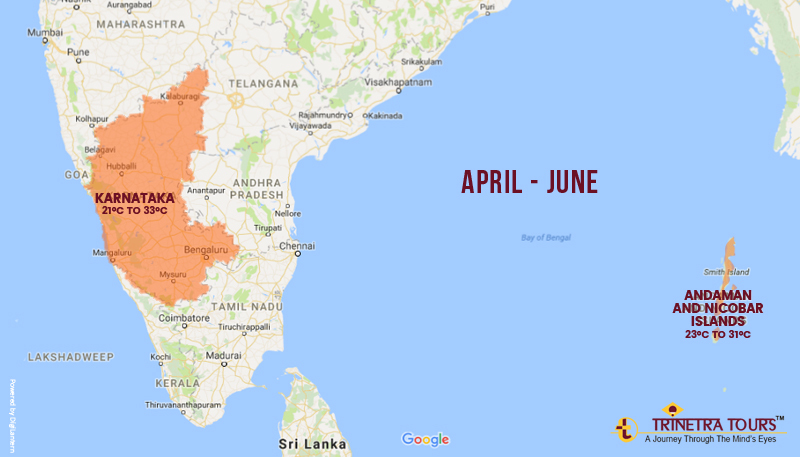 Tamil Nadu, Kerala, Maharashtra and West Bengal are some of the best choices for traveling in India during October – December months. The list of must have articles while traveling to these places includes sunscreen, insect repellent, sunglasses, hat, tropical clothing, easy footwear like flip-flops or slip-ons. There are a few things which cannot be missed irrespective of the destination you choose to travel to, such as a camera, flashlight, Compass (Some people like to know the direction in which they sleep), as well as Handkerchiefs, Travel diary, and, pens (For journaling or memory-recording). Understanding the need of essential things for travelling to a particular place enables you to travel light and saves you from unnecessary baggage. We take care of all the fundamental requirements such as first aid kits, so you need not to worry about that. Hope, this information is useful for you. If you are planning to visit India and want to know more than the information shared above, kindly reach us at tours@trinetratoursindia.com.